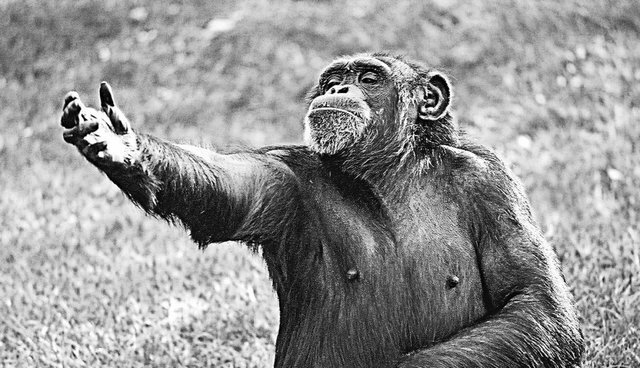 When the famous primatologist Jane Goodall was just starting her groundbreaking research on chimpanzees' social life in Tanzania, she compiled and submitted her first scientific paper for publication. To Goodall's dismay, the paper was rejected. In the paper, Goodall had used the words "he" and "she" when referring to individual animals, and the pronoun "who" when describing them. But the publication changed each of these references, replacing "he" and "she" with "it," and replacing "who" with "which." This was standard in the early 1960s, at a time when the chimps were referred to as numbers rather than names. But Goodall refused to give in. She changed each word back to its original, and the paper was eventually accepted. The move was groundbreaking, write Gaetanelle Gilquin and George Jacobs, two researchers who wrote a scientific paper about the use of the pronoun "who" to describe animals. "In the end, she won a small battle in what was to be an ongoing struggle to tear down, one by one, some of the bricks in the wall of superiority that humans had built to separate themselves from nonhuman animals." When we talk about animals, we have two choices: we can choose to use the word "who" or the word "which" to describe them. There is not a universal rule in the English language that dictates which word is right; different style guides and dictionaries employ different rules. Some approve of and even encourage the use of the pronoun "who" to describe animals. This isn't a new phenomenon, either -- for hundreds of years, literary titans have used "who" as a pronoun to describe animals. Other books with animals as main characters do the same -- George Orwell's "Animal Farm," Rudyard Kipling's "The Jungle Book," A.A. Milne's "Winnie the Pooh," Richard Adams' "Watership Down" all refer to animals using the "who" pronoun. Using "who" to describe animals isn't only seen in literary classics. For their study, Gilquin and Jacobs compared the policies for the usage in dictionaries, encyclopedias, grammars, publication manuals, newspapers and news agencies. Of these, they found that it was deemed acceptable to use "who" to describe an animal in 20 of the 45 sources -- almost half. There are lots of nuances, though -- for instance, the Associated Press Stylebook, used by many news publications (including The Dodo) says use use the pronoun "who" for "references to human beings and to animals with a name." Other noted publications that allow for the use of the pronoun "who" to refer to animals include the New York Times, the Los Angeles Times, The Independent, the Chicago Tribune, the Dallas Morning News, the Washington Post, the Wall Street Journal, the Oxford Guide to English Grammar, the Oxford English Dictionary, Merriam-Webster's dictionary, the American Heritage Dictionary, among others (though many of these include limitations on whether "who" can be used, like knowledge of the animal's name or gender). Publications that do not allow for the pronoun "who" to be used in describing an animal include the Times of London, Reuters, the Houston Chronicle, the American Psychological Society's manual, the Chicago Manual of Style, Parrot's Grammar for English Language Teachers, Cambridge Advanced Learners' Dictionary and Encarta, among others. 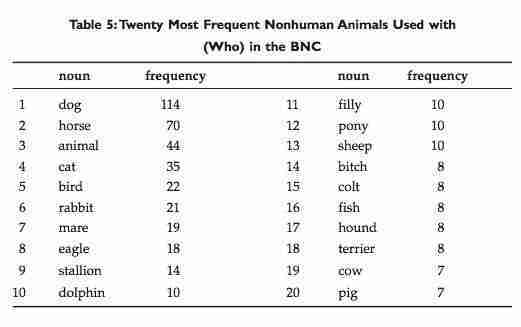 The researchers also examined the British National Corpus World Edition, a 100-million-word collection of spoken and written materials, to see how frequently the word was actually used to describe animals in the real world. The researchers found 738 sentences in which the usage is found, a frequency of .76 per 100,00 words. Although not a frequent phenomenon, the usage is certainly popular, they wrote. "I was pleasantly surprised to see so many uses of ‘who' with animals and so many reference works and style guides saying that it is okay," said Jacobs. They also found that the use of the pronoun "who" to describe animals is often used by speakers who empathize with the animal, and that it's tied to giving the animal a sort of human-like status. The key to whether ‘who' is used, said Jacobs, is "our feeling toward the animals to whom we are referring." The use of who can positively influence people's perception of the human-like nature of animals, added Gilquin, his research partner. This point is very important for animal rights, they said. By using the word "who," to describe an animal, people are likely to empathize with the animal and understand that animal as a thinking being, capable of complex emotions -- the very thing that Jane Goodall suspected over 50 years ago.